There is a phenomenon in physics and mathematics which has been captivating the minds of scientists for a long time and it is called simply “universality”. In brief, a phenomenon exhibits universality if, be as wild and diverse in microscopic scale as possible, a clear pattern emerges if one looks at it from macrosopic scale. I first encountered this phenomena from a technical point of view while studying asymptotic behavior of orthogonal polynomials, and it got me too. In this post we will see some examples of systems exhibiting universal behavior and we shall see how do orthogonal polynomials enter the picture. First let’s see some examples. I’ve drawn these from [Deift] and [Tao]. For more details and examples, check out these awesome articles. In other words, the distance of zeros follows a specific pattern. This formula, as we shall see later, will appear very unexpectedly in a different area of mathematics. 2. Scattering theory. Suppose that a nucleus is being shot with neutrons. Depending on the energy level of the neutron, it can bounce back, bounce off or go straight through the nucleus. If we count that how many neutrons pass through the nucleus and plot it against the energy level, we obtain this. 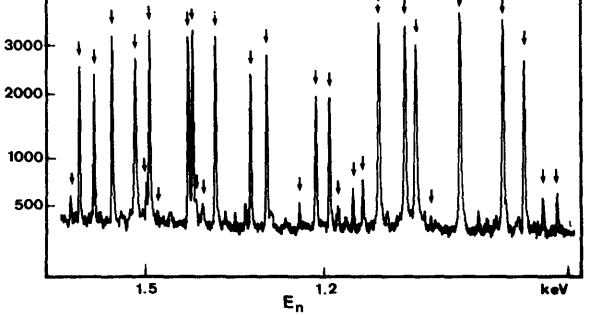 Looking at the energy levels where the count peaks – the so-called scattering resonances – we can observe the same behavior as in the zeros of the Riemann zeta function. They are again not too far nor too close to each other in average. This phenomenon was successfully modelled by Eugene Wigner using random matrix theory. We will see later that the model proposed by Wigner can be used to describe a large number of phenomena in the nature. If this example raised your interest, it may be worth checking out this awesome post from my friend and colleague. and there are so-called spotters, who informs the drivers about when did the previous bus left the next bus stop. If the previous bus picked up the passengers recently, the driver must slow down to maximize the number of passengers. On the other hand, if the previous bus left long ago, he should speed up, avoiding that somebody overtakes him. Can you guess what will we find if we study the time elapsed between two subsequent buses at a bus stop? You are probably right: the waiting time between buses is neither too long nor too small. The physicists Milan Krbalek and Petr Seba noticed this behavior when attending a conference at the city. In their paper they did a detailed analysis of this and modelled it with random matrices. They calculated the distribution of time between subsequent buses and obtained the following. The histogram is the empirical data and the continuous curve is the prediction given by their model. Can you guess what kind of model did they propose? Yes, you are right: random matrices. 1. A crash-course in random matrix theory. In order to get a good grip on universality limits (or at least, on their significance), we have to talk about random matrix theory very-very briefly. For a deeper discussion, I recommend the book [Deift-Gioev]. There are many excellent books out there, but from my point of view (to be more precise, from the orthogonal polynomials point of view) it is the most useful. is a function which tends to at sufficiently fast. is called a Gaussian unitary ensemble. The main question for us is how does behave when ? To provide an answer, we will deploy our favourite (or at least, my favourite) tools: orthogonal polynomials. Thus, using orthogonal polynomials, this connection can be exploited heavily. In the following section we shall see a way to do this. in distribution, where denotes the normal distribution with mean and variance , moreover denotes the expected value of . One common thing about the central limit theorem and the law of large numbers is that a scaling appears in both limits. Although it is not clear immediately, it is also the case for universality limits. The following theorem says that what we did above is basically a scaling. where the function depends only on the set and not on the measure . For example, if we take , we see the following. This limit distribution is known by physicists as Wigner semicircle distribution, and it appears frequently in random matrix theory. It can be clearly seen that this limit is indeed a scaling. 3. How do we establish universality limits? I’ve talked about consequences of universality but I haven’t discussed how to actually prove universality limits. First let’s assume that the following theorem holds. for uniformly in compact subsets. or study measures supported on more complicated sets. and suppose that and is equal in some neighbourhood of . The following theorem was proven by Doron S. Lubinsky, and it was a huge breakthrough in the study of universality limits. Theorem 3. (D. S. Lubinsky) If universality holds for at and both measures are “nice” in some sense (but can be much less nicer then the Lebesgue measure), then universality holds for at . The theorem and the proof can be found in its full beauty in the article [Lubinsky]. I tried to avoid technical details here to compress the theorem into a fully digestible form, but if you are interested in those details (which will be discussed in a future post), I strongly recommend this article. and in some neighbourhood of . Then, since universality holds for the Lebesgue measure, it also holds for our much general measure . The big thing about the comparison method is that before this article, universality was known only for analytic weights. As you can see in this previous example, universality can be established for continuous weights, which is a huge step. The polynomial inverse image method of Totik. This time let’s take a look at measures with compact support. We will extend Theorem 2 in two steps. First let be a polynomial of degree and suppose that if is a local extrema for , then . A polynomial like this will be called admissible. Now let be a Borel measure supported on and suppose that universality holds for at . With this setup, the following theorem holds. Theorem 4. (V. Totik) If is the pullback measure for on and , then universality holds for at . This takes care of measures with support , where is an admissible polynomial. Now let is a measure with support where is an arbitrary compact set. It turns out that in some sense can be approximated with sets of the form with arbitrary precision! Using this, we can compare our measure to other measures supported on the approximating sets. Overall, the following theorem holds. Theorem 5. If is a “nice” measure with compact support, and in a neighbourhood of with positive and continuous , then universality holds at . The method of polynomial inverse images was perfected in [Totik1], where the process is described in detail. Originally it was used to prove polynomial inequalities on compact sets, but the method found many applications, for example universality limits, which can be found in [Totik2]. I finish this long post with an anecdote. It can be found in numerous articles, for example [Deift]. And did you get this? If the zeros of the zeta function behaved like the eigenvalues of a random Gaussian unitary matrix, then it would be exactly the formula for the 2-point correlation function! I think this justifies the label “universality”. [Lubinsky] Doron S. Lubinsky, A New Approach to Universality Limits Involving Orthogonal Polynomials, Annals of Mathematics, 170 (2009), 915-939.